Space, the final frontier. We all, or at least most, recognise that line from Startrek. I am a great Startrek fan, and am quite amazed at some of the scenes presented in the Startrek series. We often shrug these off as science fiction, but the universe truly is a wondrous thing. This new picture will leave you awe struck. I previously blogged about pictures taken from space termed "The Eye Of God". What a wonderful site that was. Now another picture reveals some more fantastic scenes in space. 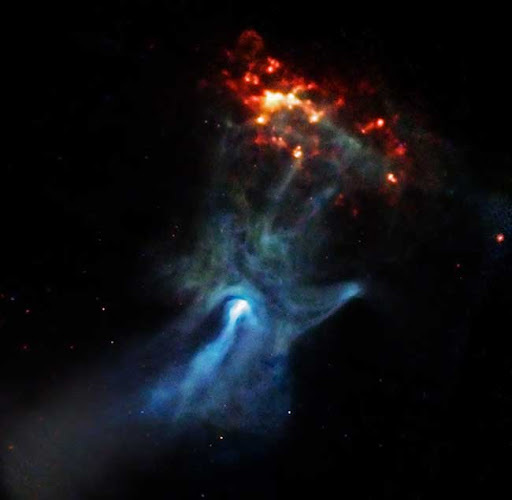 In a new image from NASA's Chandra X-ray Observatory, high-energy X-rays emanating from the nebula around PSR B1509-58 have been coloured blue to reveal a structure resembling a hand reaching for some eternal red cosmic light. Strong magnetic fields, 15 trillion times stronger than the earth's magnetic field, are thought to be involved. The combination drives an energetic wind of electrons and ions away from the dying star. As the electrons move through the magnetized nebula, they radiate away their energy as X-rays. The red light actually a neighbouring gas cloud, RCW 89, energized into glowing by the fingers of the PSR B1509-58 nebula, astronomers believe. Behold the "Hand Of God". If you thought that this was cool, check out the "The Eye Of God"